Do you ever find yourself walking along the sidewalk and staring at a manhole cover in the street to see if one of the Ninja Turtles is going to pop up and say, hello? Don’t you wish you could join those awesome brothers on their gnarly adventures? Well, maybe you just need to show them that you can fit in with the team! How do you do that? Well for starters you need to get the look down. 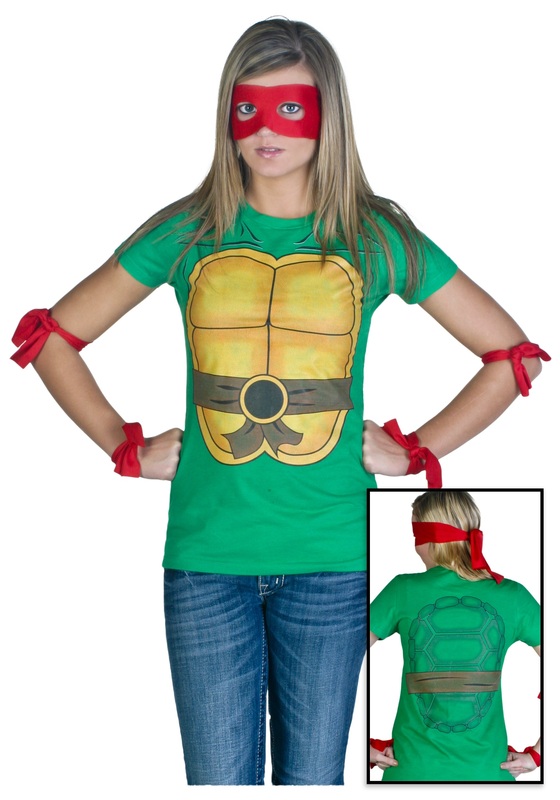 Grab this Women’s Ninja Turtle T-shirt and you’ll look like the long lost sister of the teenage mutant quadruplets! Once you start to master your martial art skills, the guys will be more than happy to invite you into the sewers for some good ole turtle fueled fun! Grab an eye mask that matches the color of your favorite turtle’s and you can dress up as Raph, Donnie, Leo, or Mickey for Halloween. Or you can go as a whole new turtle with a mask of your favorite color. Maybe it’s yellow, maybe it’s pink, the choice is yours! Cowabunga!